My protagonist is illiterate. She recognizes a few letters, she can identify her name, and she loves listening to stories more than anything. But she cannot read. Her name is Serena, and Serena is a bad blood. Bad Bloods in 35 words or less: 17-year-old Serena is the only bad blood to escape execution. Now symbolized for an election, she must prove her people are human despite hindering abilities before everyone is killed and a city is destroyed. While Serena lives in a futuristic world where magical children like her are executed, illiteracy is a very real issue in our world today. An issue I wanted to discuss in my Bad Bloods duology. There are a lot of misconceptions surrounding illiteracy—some of which I discuss in an article Tackling Diversity in YA—but the main one is the fact that illiteracy isn’t as uncommon as the average reader might think. For readers, this fact might seem startling. Readers generally know other readers, after all. And—on top of that—many of the characters in YA fiction love books, because readers love books, and it’s easy to relate to a character that loves the same things as them. For many readers, it’s impossible to imagine a world without reading, even in fantasy and sci-fi settings. I, for one, definitely struggle with that concept, but illiteracy is a reality for many young people, especially women all over the world. Granted, I will be the first to admit that I did not set out to write Serena as an illiterate person to spread awareness. No. I originally set out to write her as a character who didn’t enjoy reading due to severe dyslexia—something my brother and father deal with to this day. As a child, growing up in a household where my two role models didn’t read was very difficult, especially when my late mother was a reader but no longer able to share that joy with me. That being said, we can relate to one another—readers or not—as people, and since so many characters are readers, I wanted to remind readers we can love those who don’t read, too (although maybe we can help them find the perfect book so they try reading again)! We can also understand how illiteracy happens, and hopefully, we can learn to sympathize with it and also help others learn to read in the future. The issue of illiteracy developed with Serena’s character over time, but I wouldn’t change Serena for the world. She is smart. She is caring. She loves ice cream, her friends, and stories told beneath the full moon. She falls in love. She cries. She feels pain and sorrow. She laughs. Serena may be illiterate, but she still has a story. And so do the millions of people around the globe dealing with illiteracy today. That is why she’s my protagonist. Wow! August, I’m looking at you. You are wonderful. Thank you for being a part of my life this August. In other news, November Snow arrived! I loved holding it in my hands. And since I could finally buy some books, I got all the books I could for Penned Con St. Louis. I’ll be there at the end of September! I’ve also confirmed that I’m traveling to Charleston, South Carolina in November for YALLFest! (Can’t you tell I love traveling?) I hope to meet some of you there. I also got new author photos this month! Thank you, Huntress Photography! My #1 clicked item was Bad Bloods: November Rain again! 1. Naming Your Characters: A lot can go into naming your characters, but hopefully, all these websites and tools help make the process smoother (and therefore, more fun)! 2. I Love Free Readers: There has been a lot of controversy surrounding readers who only read books they can legally get for free, but hey! I love them, and here’s why. 3. An Author Who Fears Public Speaking: Public speaking used to FREAK me out. But my speech class in college gave me the confidence I needed to accept my stutter and meet friends while laughing about my speech impediment. Now, I’m not afraid anymore. Heroes I Want To See in YA: There are so many of them! And check out the comments. You all had the best conversation on this article. When You Shouldn’t Write That Book: And I’m not talking about writer’s block. #SATurdate: The Secret Life of Pets, #1 YA Sci-Fi, Noble My Love, Criminal, & Aerie: A weekly update of what I’m reading, watching, drinking, etc. 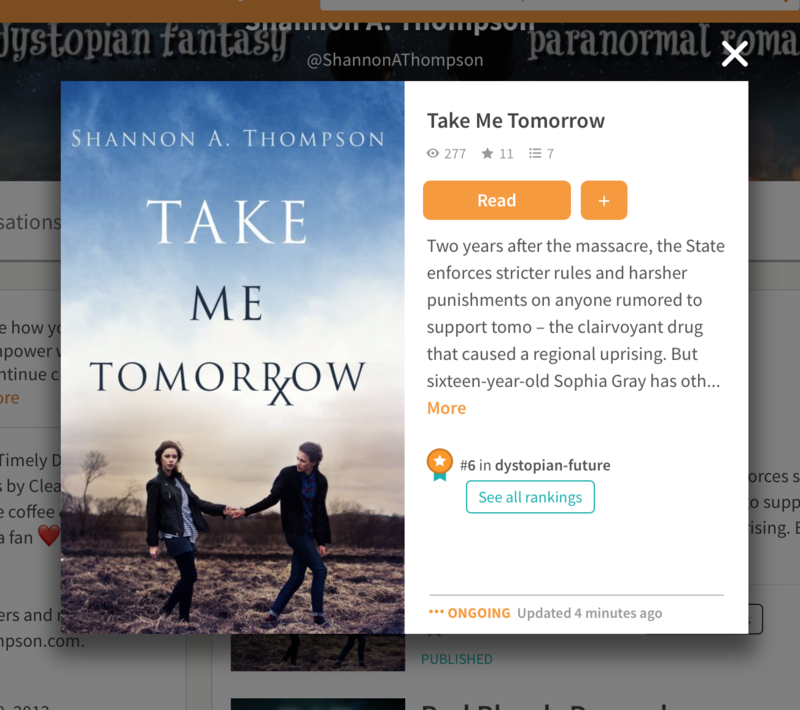 Connecting Books Across Genres: Surprise! All my books are connected somehow. #SATurdate: Suicide Squad, Little Alchemy, Marshmallow Popcorn, & Cinderella and the Four Knights: A weekly update of things I’m watching, reading, and more! 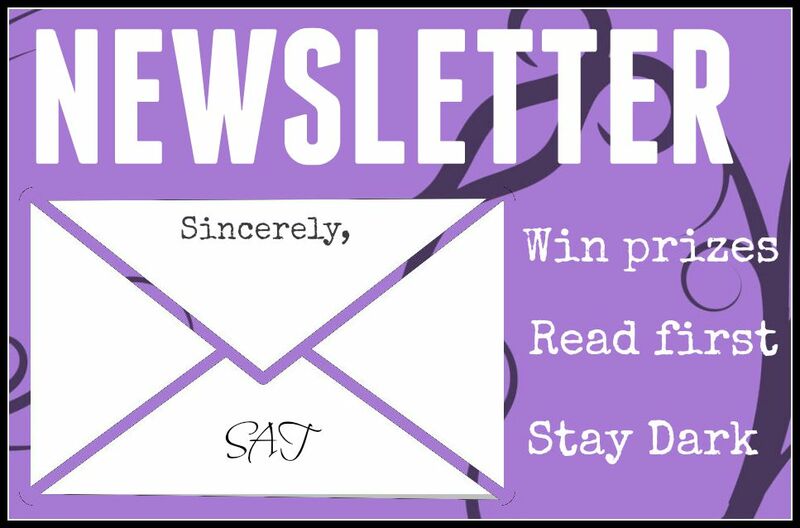 #SATurdate: Star Trek, Tallulah, Free Book, & Rice Maker Cake: A weekly update of everything I read, saw, and experienced! #SATurdate: An Ember in the Ashes, A Torch Against the Night, W – Two Worlds, & YALLFest: Another weekly update of books, music, and more. Website Wonders: A monthly update of all the websites I came across and loved. Every month, I share all of the websites I come across that I find helpful, humorous, or just awesome. Below, you’ll find all of August’s Website Wonders categorized into Writing, Reading, Conspiracies, and Procrastination. Favorite Article: Goodbye, Bad Bi: The Lose-Lose Situation of Bisexual YA. This article is SO SO SO important for both readers and writers. Why? Because bisexual characters are often misrepresented and labeled terribly based on who they “choose” in the end, and the trend needs to stop. I loved this thoughtful article, and I definitely think it’s a place to start if you are considering writing about a bisexual character. Whether or not you’re writing though, I think it’s a great, educational article to consider no matter what. Final Editing Checklist: This was SUPER popular during #PitchWars, and I think this list is awesome. 7 Bookstores Too Beautiful For Words: Books are beautiful enough, but come on! This is perfection. The 10 Most Influential Poets in History: Sent to me by the writer! I love these articles! 10 Strange Mysteries Around the World That Are Still Unsolved: Put on your tin foil hat with me, and enjoy some good ol’ mystery. Top Ten Places You Can’t Go: Can’t you tell I spent way too much time reading conspiracy theories this month? The 6 Creepiest Unexplained Phone Calls: I…can’t…stop…reading…creepy…stories. Little Alchemy: I’m playing it like crazy…and you should, too. 18+ Pictures of Fairy Tale Architecture From Norway: So pretty. Lost in a Whimsical World: These drawings are beautiful and eerie and wonderful. Wonderfully Witty Animal Comics by Liz Climo: These are too cute and funny for words. I hope you love these articles as much as I do! Valentine’s Day was meant for love, and though my mother had married on such a lovely day, the world worked opposite for bad bloods. I was no longer welcome. I was lucky that I’d been welcome for fourteen years, and he knew it. I looked over his shoulder, trying to find her eyes, but she had stepped away a long time ago. “Mom—” I started to shout, but a sharp pain snapped my face back. Heat rushed across my cheek, fire burned beneath my skin, pain etched itself into my bones. I could no longer see. My head spun, but I felt dirt beneath my fingertips. I had fallen down. “Now get outta here, boy,” he said. I always imagined he would call me Steven. You’re gonna have a stepdaddy, she had told me weeks ago. A daddy. Mine had left long ago. And now, it was my time to leave, too. And I didn’t think I was brave enough to die. Continue reading on Wattpad, and get the first book in the Bad Bloods series for FREE on all platforms. #SATurdate: An Ember in the Ashes, A Torch Against the Night, W – Two Worlds, & YALLFest. Honestly, I’ve put the next Bad Bloods books away for now. Sophia would not shut up, so I spent my writing time obliging her this week. Basically, I wrote in book 3 of the Tomo Trilogy, Take Me Never. I know. I know. Book 1 isn’t even out, so a lot of you have no idea what I’m even talking about, but I will not—and cannot give up—on this girl. She’s loud and stubborn and loves everything just a little too much. I’m 6,179 words in, and since this week’s #1lineWed theme was “work”—this line is from Take Me Yesterday, the sequel to Take Me Tomorrow (which is complete). I promise I will get this series into readers’ hands one day. 😀 I also worked on a brand-new story after researching for a ridiculously long amount of time. But that’s all I’ll say about that book for now. For those of you who follow even my books with only initials as titles, I rewrote the beginning of B, AGAIN. Why? I know I can write B. (B is a contemporary I’ve been attempting for about a month now.) I’m just trying to find my footing with it. I like giving these updates—even if they are crazily obscure—because I think, one day, (hopefully), if one of these books ever gets into the hands of readers, they’ll be able to go back on my website and see the daily grind of it all instead of thinking writing happens overnight. I want to share the journey, so other writers know the journey is the fun part, including the struggles and hurdles and writer’s block and rewrites and little successes. Every writer’s journey is different, but every journey should be fun! Now that I’ve said that, Bogart the cat was my editor this week. I received some awesome feedback from a great lady, and Bogart let me know what he thought via Instagram. Here was that photo series. I also started Blue Lily, Lily Blue by Maggie Stiefvater. It’s the third book in The Raven Cycle, and if you haven’t checked out this series, do so now. It is perfection. Since I was writing in Take Me Never, I returned to my lovely Take Me Yesterday playlist on YouTube. Check it out! I started watching W – Two Worlds, and I LOVE it. Special thanks goes out to Siamese Mayhem for recommending it to me, but basically, it’s the best K-drama ever. It follows the daughter of a web comic as she accidentally portals herself into the comic to try to save the hero from being killed by her own father. It’s thrilling, romantic, hilarious, and simply awesome. My oven broke! I am so sad. Baking is basically the only thing that gets me off my computer addiction (because, let’s be honest, you can’t have a laptop next to a cake mixer), so…not going to lie, I drove an hour to borrow an oven to make cookies. Rain boots! It was storming like crazy here. Great writing weather. A Torch Against the Night by Sabaa Tahir! We’re so close. So…I was a monk…and there were tons of monsters everywhere…and I had to defend the last glass of red wine on earth? I have no idea. But the fight scenes were epic. I managed to hold onto a glass of red wine while fighting the world at the same time. If only I were so smooth in real life. (I am the clumsiest person I know. In fact, I fell down the stairs for the SECOND time this year this past week. I’m in so much pain it’s stupid.) But thankfully, this time, I only caught rug burn. I got more cat lady office décor! I’ll be sure to share it soon. I’m a young adult author who writes in various genres. I have contemporary, paranormal romance, fantasy, and science fiction published, but my two main series include a Dark vs. Light paranormal romance that takes place in the small Midwest town of Hayworth—The Timely Death Trilogy—and a science fiction duology—Bad Bloods—about children with hindering abilities fighting against an election that decides if they will continue to be executed or not. While The Timely Death Trilogy takes place in modern Kansas, Bad Bloods takes place in an undisclosed southern city bordered by the ocean and locked in by walls in the year 2089. Despite having different locations, time periods, and genres, these series are connected. Well, let me tell you without spoiling it for you: the characters. If you read The Timely Death Trilogy and you also read the Bad Bloods Prequel (FREE on Wattpad), you will get to know a little girl named Violet. She is the key to the connection. But that’s all I’ll say for now. Why did I connect these two, seemingly unrelated stories? Because they ARE related, and they always have been in my mind. I mean, they existed in my mind at the same time, after all. And so do all of my stories. Which, basically means I connect all of my novels in some way or another. Consider it a wink to all those readers who follow every book by an author. But how do I do this? I’m not sure there’s a method, necessarily. I always tell aspiring writers to follow their gut, and this is often why. For instance, I definitely don’t know every book I will write in my life time, but by keeping my mind and heart open to the characters (and honest), I guarantee they’ll reveal a weird twist of how they got to know each other while hanging out in my mind space. As an example? Many readers were dying for a continuation of The Timely Death Trilogy (or a happily ever after epilogue), but the truth of it was, whenever I attempted to tackle a shiny, pretty ending, I only saw my characters lives becoming more and more complicated as they grew older. (A reality, really.) And while I wanted to leave everyone on a happy note, Violet’s character in Bad Bloods is so powerful to The Timely Death Trilogy, I couldn’t deny what she wanted to say: the truth. And that truth became the connection, and to me, these connections remind us an important truth to every story. Connecting books across genres shows that a character’s story never ends, even when the pages do. I have new author photos! Check out my right side tool bar to see it, and of course, special thanks to Huntress Photography! My publisher is also hosting an August Back to School Giveaway! You can win a $25 gift card to Amazon, CTP mystery boxes, November Snow, and many other books! The average day as an author varies from writer to writer, but I think there’s a huge misconception that we wake up, write all day, and fall asleep at the end of the night with thousands of words ready for print. In reality, most authors—yes, even The New York Times Best Sellers—work day jobs. Writing is our second full-time gig. And I’m not an exception. I wake up at 3 PM. Why? I work a night shift, so I don’t get to bed until about 6 AM. I also work opposite days, meaning Sunday-Tuesday is my weekend. This can cause some awkwardness online, because some have assumed I’m ignoring them on the weekends when I am, in fact, working. But I do work from home, so I can sometimes check in on my author life during my lunch break and dinner break. This is also why you see my #MidnightBaking posts a lot. While it’s midnight for you, it’s dinner time for me. Honestly, I work from 4 PM to midnight as an editor, social media marketer, and anything else you might find on my Services page. I love it. I absolutely love reading authors’ works, talking to fellow writers, and helping those with social media, because social media is something I honestly enjoy, hence why I blog three days a week. As an author, I also use Facebook, Twitter, Instagram, Goodreads, MailChimp, Wattpad, and YouTube on a regular basis. But all that is generally done in my next step. My average day as an author always includes three things: coffee, cats, and books. I’m an author. Finally. If I’m not completely exhausted from work—and I get all my housework done—this is where I write. But this is also the only time I have for marketing, so I often spend about a half of the time writing articles, sending out personal emails, researching books, and more. If I’m too tired, maybe I just read the current book on my nightstand. But I tend to write in this time period. If I can get one chapter finished and outline my next chapter for the next day, I am satisfied. It was a successful day. I try to relax here, though I’m really bad at it. This is where I should be reading instead of writing (or even watching TV). Something—anything—to calm down my writer’s mind (or I won’t sleep at all), but more often than not, I’m curled up on the couch with my notebook jotting down more ideas as they come to me. I might even get back on the laptop. I find myself pulling 12-hour shifts (or longer) on a regular basis. This is probably why I’m addicted to coffee. Okay. So I have night terrors a lot. Not so majestic. But, hey, it helps inspire my writing! P.S. It’s really HARD to sleep during the day. Lawnmowers. Sunlight. Truck engines. You name it, it has woken me up. Writing for a living, more often than not, is not our living, but we do live for it. I love finding time between gigs to sneak in a few words or tweet back and forth with awesome readers, but I’m mainly working a regular gig like everyone else. And, hey! I love my day job. I honestly think my day job helps me be a better writer, and I get to read all day. It’s a dream come true, right? If anyone is curious, I’m currently writing this article on my weekend. It’s Sunday, July 17, at 10 PM, so more than two weeks before you will be reading this. But it’s some of my only free time to blog, so I write ahead of time since I know work can get unpredictable and crazy. Even better? Now, I have time to go write. Original covered my average day as a writer in 2013. Blake’s origin story released on the FREE Bad Bloods Prequel on Wattpad. If you’ve ever wondered how a baby boy ended up in the Northern Flock, read his story here. I’m expecting to release Ami’s story from the Southern Flock on August 12. I’m also working on the sequel – July Thunder/Lightning – now! 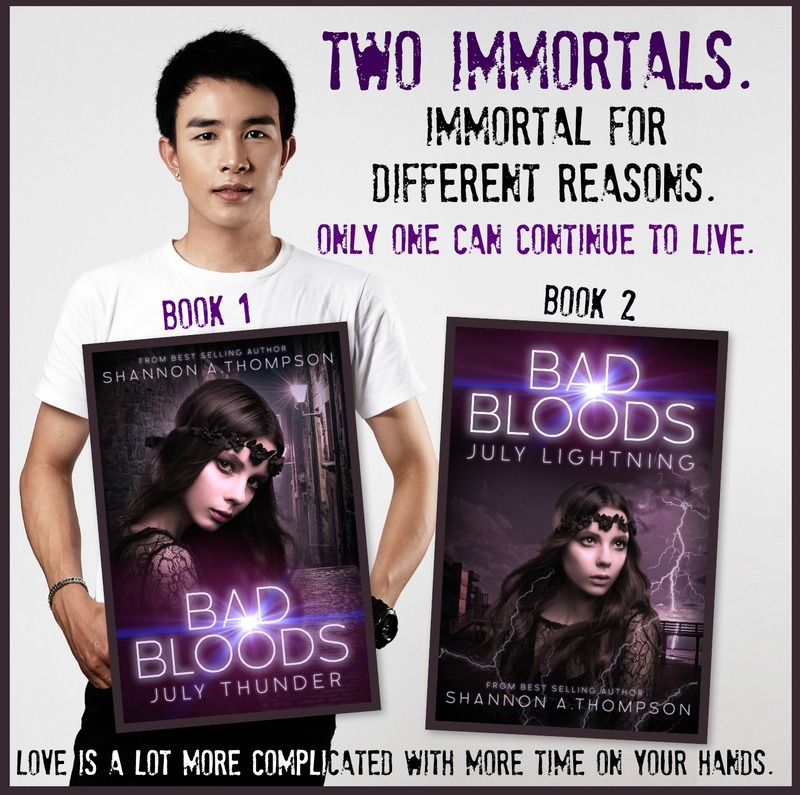 I hope you’re reading the Bad Bloods series! Book 1 is only .99¢!